This is just part of the metal we unloaded from the freight truck. 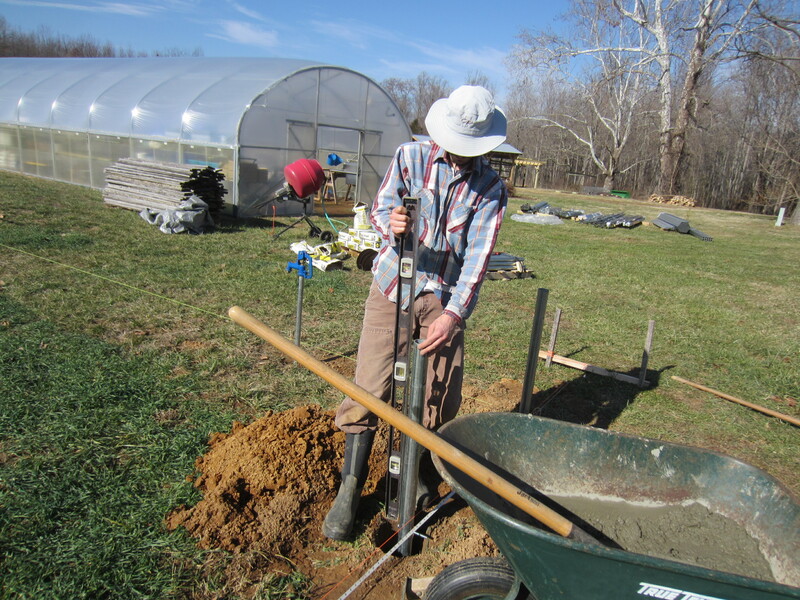 For the construction of the other two high tunnels Gavin and my Dad pounded the posts into the ground with a sledgehammer. This is back-breaking work that’s at an awkward level and hard on the wrists. Trying to make things a little easier this time by using an auger to drill the holes. 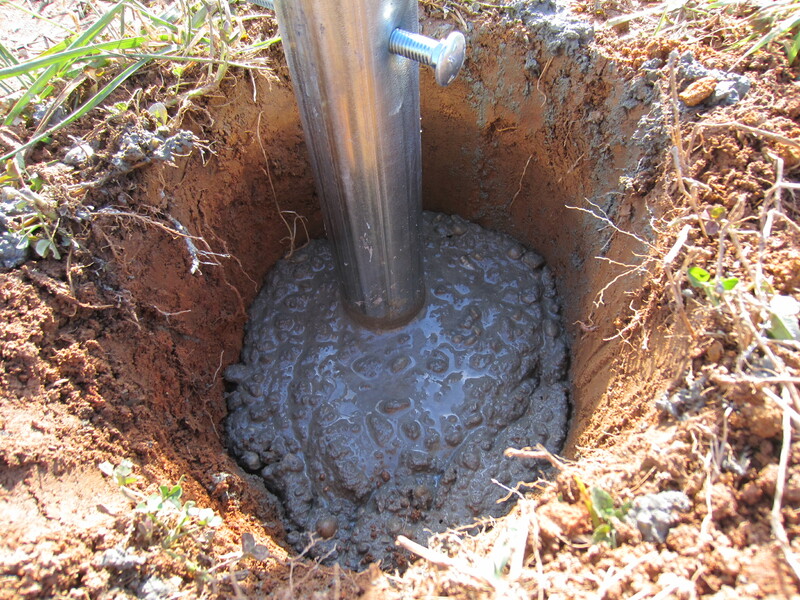 We are setting most of the posts in concrete for this structure, even though it will take more time. 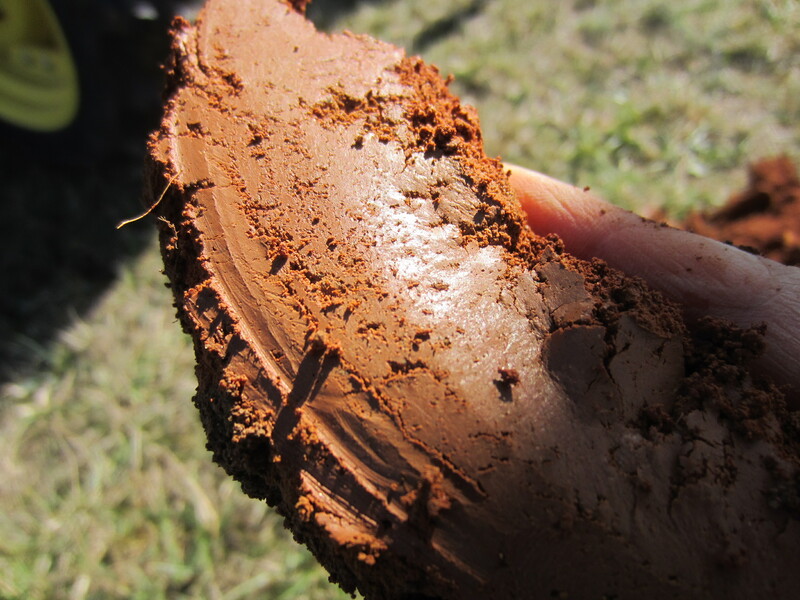 The subsoil under this part of the farm is bright orange clay. 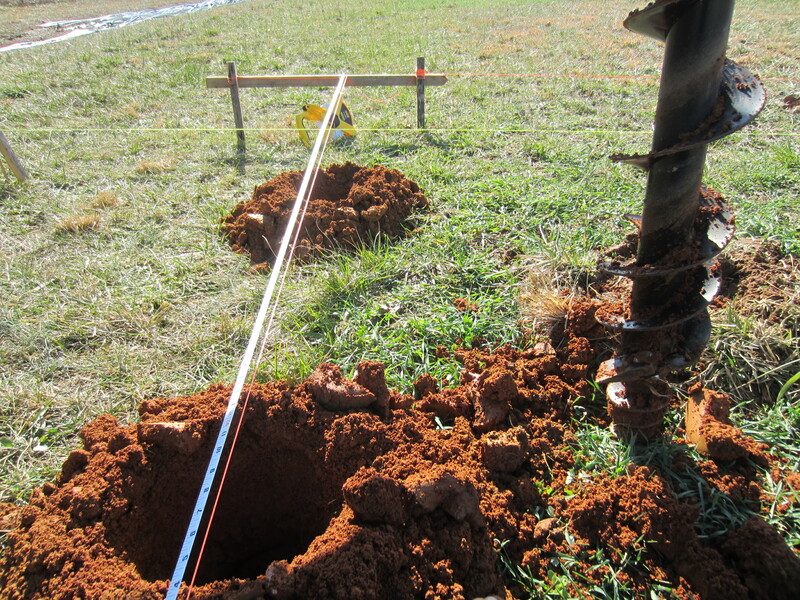 With all the crazy wind we’ve had lately it makes sense to put every effort into building a secure foundation. The construction manual for the greenhouse actually calls for putting every single post in concrete. That would take a couple of pallets of concrete, so we’re just going to use concrete for every other post. 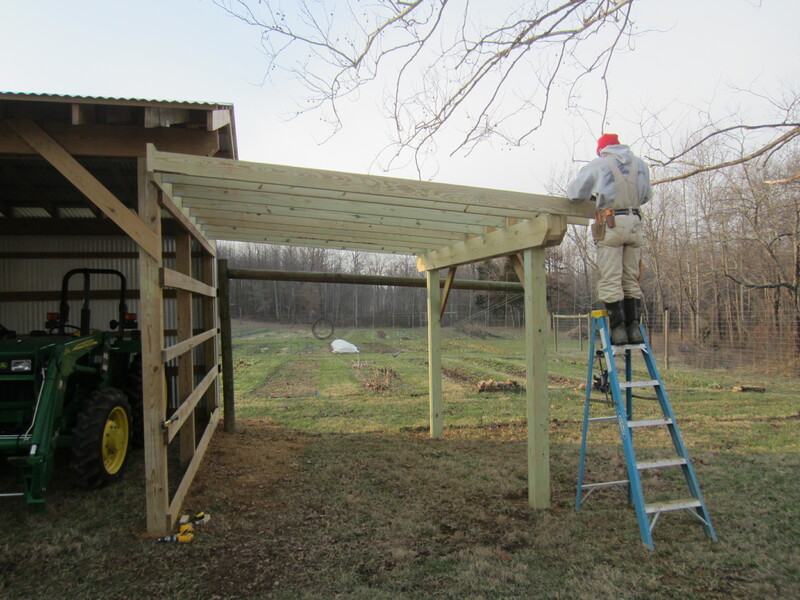 Gavin’s almost finished the framing work on the shed additions. Now just waiting for the weather to warm up to do the metal roofing and walls. All the seedlings I started in January are ready for potting up. 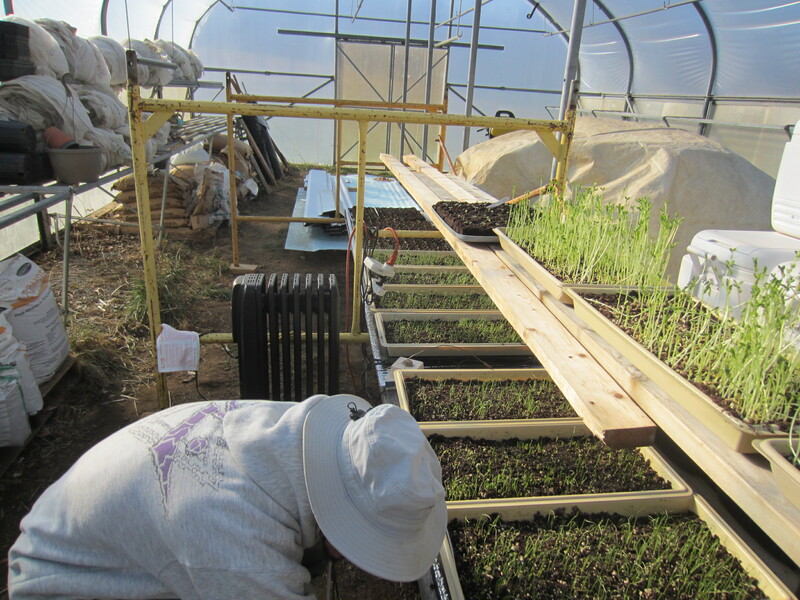 Time for them to move out of the yurt and into the greenhouse, to make room for another round of seeds. 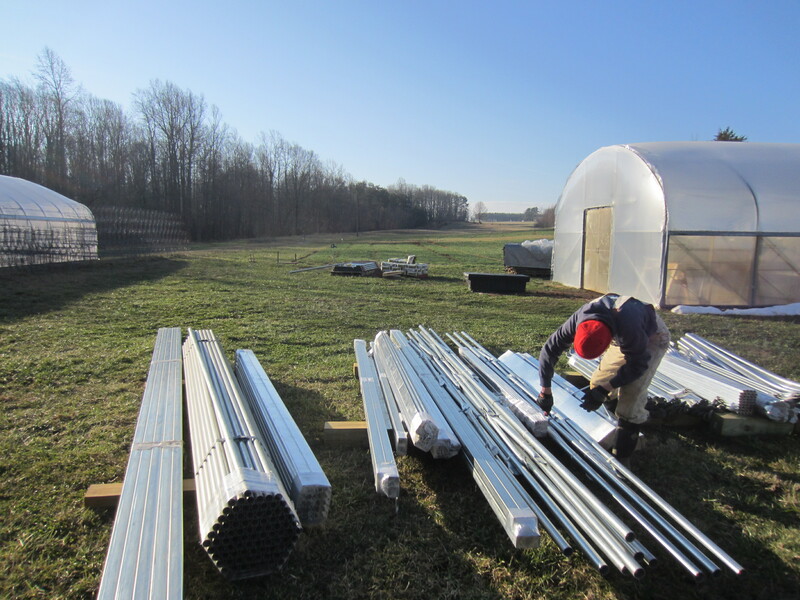 Still no heat in the greenhouse… yet another future construction project, to set up the wood stove. 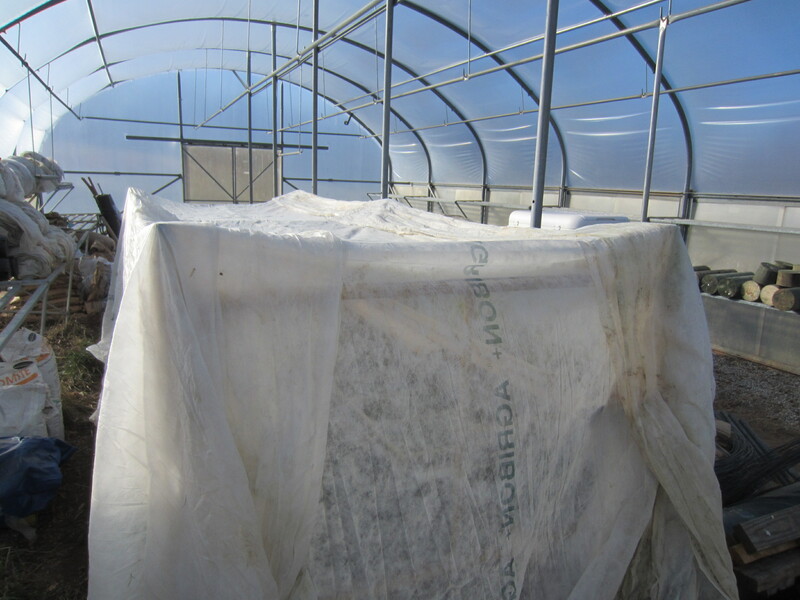 This greenhouse is huge for a potting house at 1200 sq ft, at least at our small scale, but with the benches that came with the structure it would be silly not to use it for this purpose. Who knows, maybe someday we’ll need this much transplant space. We already have the wood stove for heat, we just need to buy the stovepipe and detail a way for the pipe to go through the plastic end wall. In the meantime, we rigged up a little heat chamber out of scaffolding, boards, and heat mats. It’s a step up from last year’s design. At night I drape row-cover over the scaffolding to keep the heat in. This should work okay for now. Our next winter market date is February 9th. 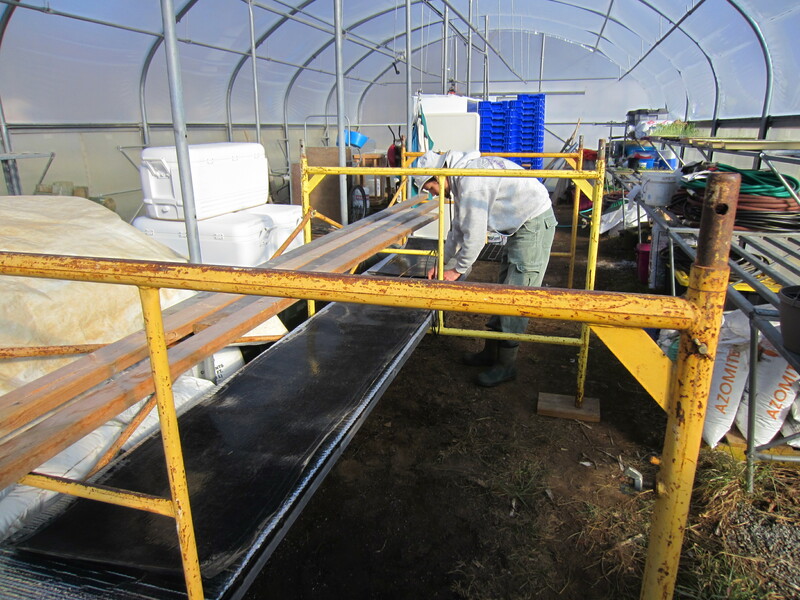 We are getting ready to harvest everything remaining in the high tunnel so we can start new spring crops. 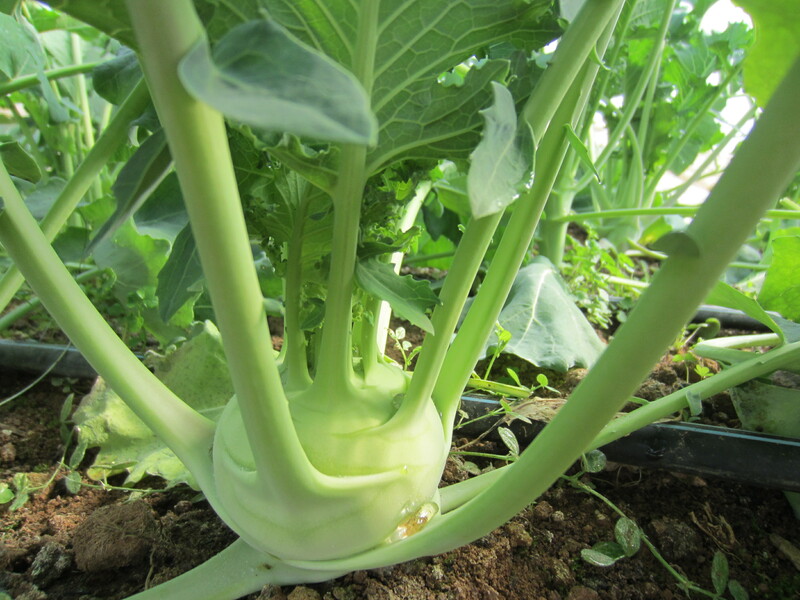 This kohlrabi has been growing slowly all winter in the tunnel. I’m looking forward to a fresh slate! 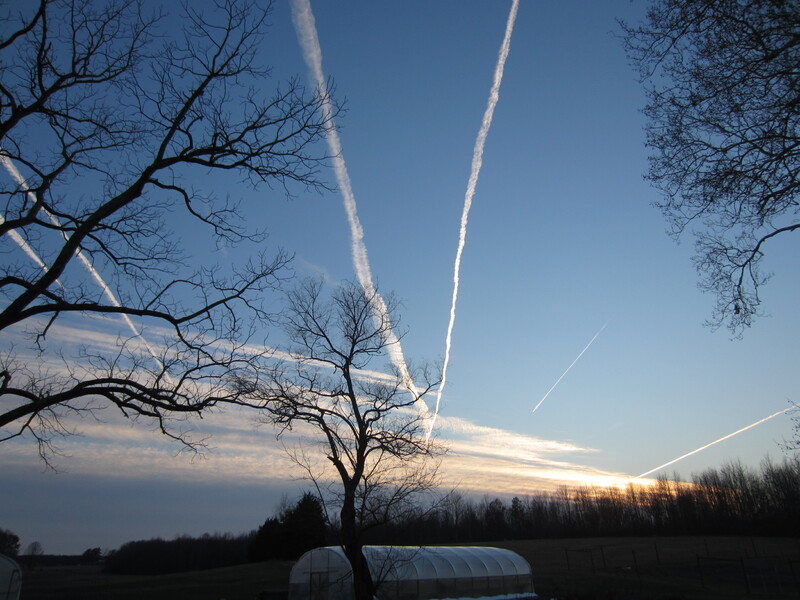 Winter sky over the farm. And you thought we were just resting with all our down time, right? Rest is not in your vocabulary! What a lot of work for this time of year! We see lots of progress however. I look forward to seeing the changes. It’s in my vocabulary but not Gavin’s. His desire to always work never ceases to amaze me. As always, thanks for the update and the great pics. The mild winter has been a great opportunity for moving forward with projects and it looks like y’all have been taking good advantage. 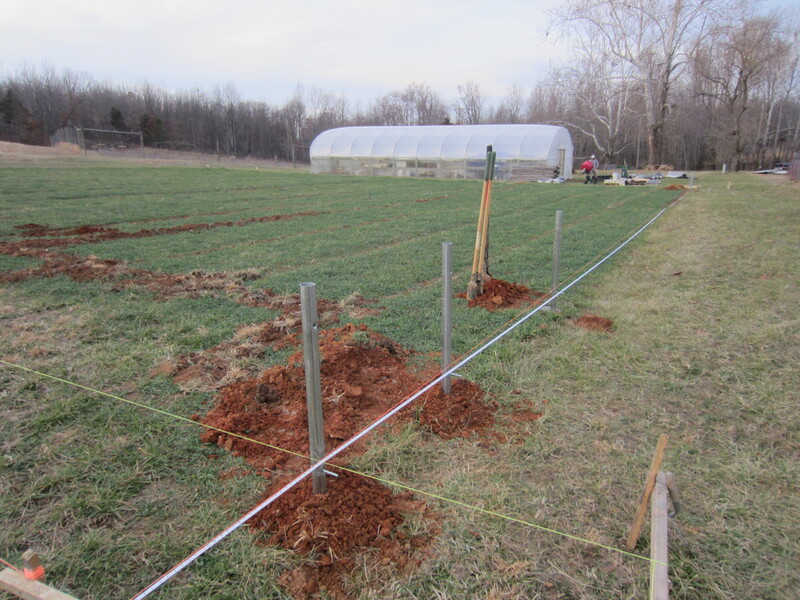 I laughed at the part about using the auger rather than driving posts by hand with a sledge. I’ve driven many posts with a sledge. 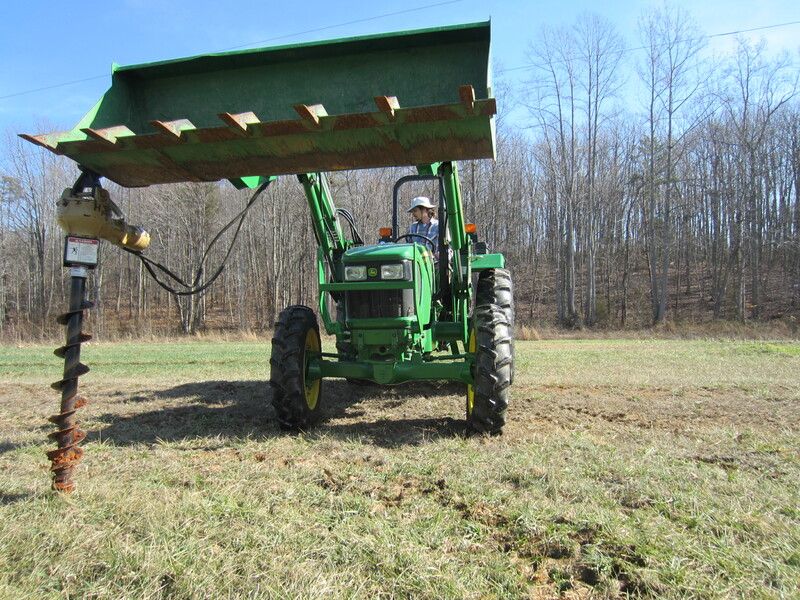 I discovered the auger attachment for my tractor some years back and have used it ever since. Keep up the great work and pray that spring comes early with just the right amount of rain at the right times. It’s always nice to have the right tools for the job. And friends who’ll lend them to you when you need them! Thanks for following! I enjoy your blog as well, which I found through domesteading. Looks like you had a great trip, I can’t wait to see more of your journey. Traveling by train is so fun! I don’t know about light years ahead with what we are doing, it is such a learning process! Some experiments are more successful than others, but there is always something to keep me fascinated with this farming life. Great photos. The last one is especially beautiful. I have high tunnel envy. Thanks, Bill. Tunnels are great for growing in especially this time of year when we can really get a jump on the season.